Just the two pretties for you today, but how very pretty they are. You know how much I love retellings. Bu these aren't just any old retellings. These are epic tragedy retellings. I am so there! I've read a couple of Mette Ivie Harrison's books before, but Josephine Angelini is a newcomer and I'm anxious to see how they both take on the age-old Tristan & Isolde and Helen of Troy myths respectively. A modern day retelling of Tristan & Isolde. As if that weren't enough to recommend it. That cover. Oh, that cover. It gives me the feelings. A young witch named Izzie makes a love potion for her best friend and then accidentally ends up drinking it herself and falling in love with the new boy at school--Tristan--and, well, you know the rest. The somewhat slim 272-page count makes me a little nervous, but I'm eager to get my hands on it just the same. The only thing I wish they'd changed about this one is the title. I realize the inherent appropriateness of it, given that this is a modern retelling of the Helen of Troy myth. But it will also be the honest-to-goodness fourth book I've read with that exact title. Ah, well. Set in Nantucket, Helen Hamilton has dreams of three women weeping tears of blood and slowly realizes that she, like Helen of old, is on a path to start a war. Both of these are on my to read list. Pretty coverses. 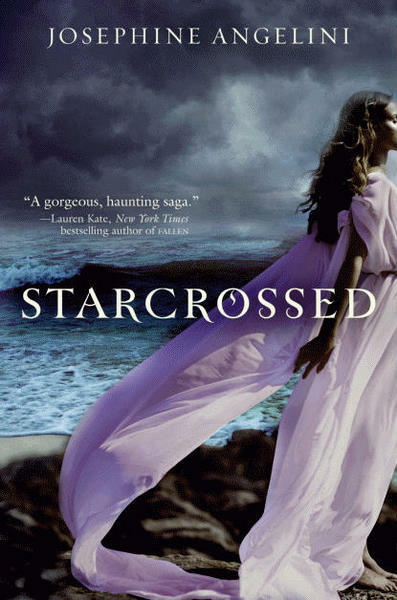 I think, if I'm honest, the title of Starcrossed would have probably put me off without that cover. I appreciate its significance but you'd think, as an author in a relatively wee market of retellings, you'd be anxious to stand out. Nevertheless, the shiny cannot be denied. Our cover isn't as shiny. Poop. These both sound really good and definitely great covers! i've def been jonesing for Starcrossed. but, like you, the title makes me BLECH. they should cap titles after like 3 uses. for reals. This is the closest I have come to wanting to lick my computer screen in a while. i want them. i want them bad. I'm surprised they used that title considering it's also the title of a recent-ish book by Elizabeth C. Bunce (though the capitalization is different... her book is StarCrossed, I believe). Um...how are we supposed to wait until October for Tris & Izzie??!! Ooooooo! I love Mette Ivie Harrison, and that COVER! It's definitely the most beautiful thing I've seen all day, possibly all week. LOVE. Oooh so pretty. And they're retellings of Tristan and Isolde and Helen of Troy, WANT! I'm adding these to my wishlist. I first heard about Tris and Izzie a couple days ago and I'm already super excited about it. 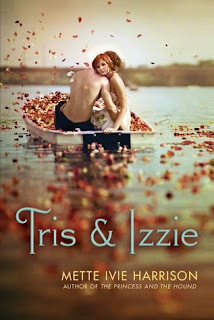 These both look great, but Tris & Izzie definitely gets all my attention! It's just gorgeous, all over, the picture, the font, the idea of a Tristan and Isolde retelling... want! Did you ever read Marion Zimmer Bradley's The Firebrand? Haha, yup, sometimes I'll see a book and think, "I've read that book before" and I'll cycle through possible plots that I think it's about only to find out that the book has nothing to do with what I thought. Then, I'll realize I've probably read other books with the exact same or similar title. It seems to me that there's a slew of really gorgeous covers out, but these are above and beyond. I didn't know Mette Ivie Harrison had a new book coming out. And the other sounds intriguing as well. These two books look amazing!! Great blog and reviews!